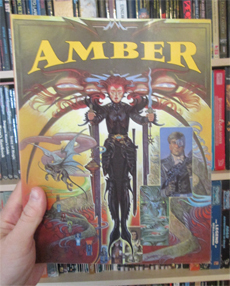 My high school girlfriend introduced me to the Amber series back in the early 1990s, and shortly thereafter to Amber Diceless Role-Playing, the RPG based on the books. Zelazny, like a lot of Appendix N authors, writes with economy and punch. Nine Princes in Amber grabbed me with its opening sentence, “It was starting to end, after what seemed most of eternity to me,” which hooked me on the whole 10-book series. From there, Zelazny goes on to sketch one of the series’ best characters, Corwin, in just a few pages, establishing him as tough, dirty, quick to heal (very quick, you discover later on), and missing his memory. It’s a great opening chapter, and it sets the tone for a series that’s full of surprises. The core concept of the Amber books is fantastic: Amber is the one true world, and it’s surrounded by an infinity of other worlds whose laws of physics vary from Amber’s. Earth is one such world. The Amberites, the family chronicled in the series, can walk between those worlds in Shadow, and by pursuing specific ends they’ve each become the best at what they do. If an Amberite wants to learn to play the guitar, she travels to a world where time passes much more slowly than it does back in Amber, where years pass for every minute, and spends a century learning to play. Then she returns to Amber, less time having passed than it takes for a cup of coffee to cool, as the best guitarist in the universe. Life as an Amberite is a constant political game of one-upsmanship and underhanded scheming. The series is full of backstabbing, skullduggery, politicking, magic, and memorable, larger-than-life characters. My three favorites have always been Corwin, the voice of the whole first series; Benedict, the master of warfare, who is such a skilled warrior that he constantly anticipates every possible threat to his person; and Random, Corwin’s younger brother, an upstart in a family of squabbling gods. The climate was warm and the colors bewildering, and everyone thought we were gods. Bleys had found a place where the religion involved brother-gods who looked like us and had their troubles. Invariably, in the terms of this mythos, an evil brother would seize power and seek to oppress the good brothers. And of course there was the legend of an Apocalypse where they themselves would be called upon to stand on the side of the surviving good brothers. I wore my left arm in a black sling and considered those who were about to die. 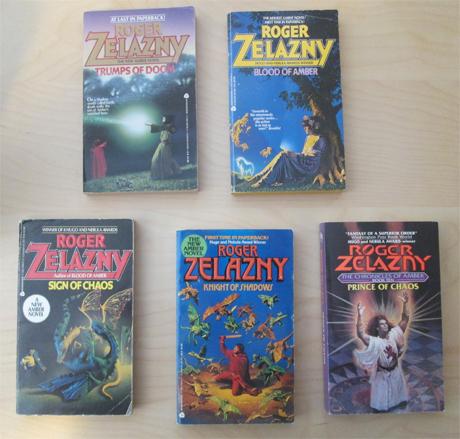 I thoroughly enjoy Zelazny’s writing, and his talent is on full display in the Amber books. The second series, five books that comprise the back half of the Chronicles of Amber, begins with 1985’s Trumps of Doom. It’s post-Appendix N, and not quite as good as the original series, but still excellent and enjoyable. 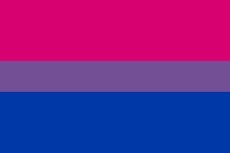 It introduces all sorts of cool things to the Amber universe, and it’s worth reading. 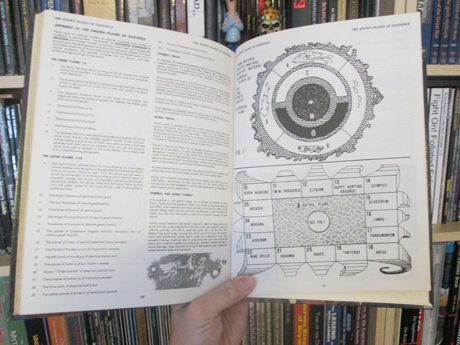 The strongest connection I see between the Amber books and AD&D is the similarity of Shadow, with its infinite panoply of “shadows” of the one true world, Amber, and AD&D’s planar cosmology, with its Material Plane, Limbo, and many other planes of existence. The planes are described, briefly, and diagrammed in Appendix IV of the Monster Manual. Nearly a decade later, the Manual of the Planes covered the planes in much greater detail. More generally, there’s plenty of stuff in the Amber Chronicles that D&D characters engage in all the time: fights, magic, backstabbing, politics, artifacts, wars, schemes, and much more. Parts of the Amber books feel like D&D in a way that’s hard to pin down, and I can see how AD&D drew inspiration from them in fuzzy-yet-signficant ways. 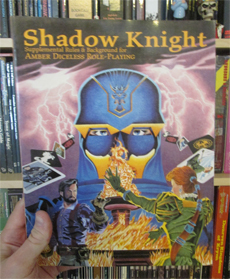 Worth a quick sidebar is a game much more closely tied to the Amber books, Eric Wujcik’s Amber Diceless Role-Playing, and its lone supplement, Shadow Knight (which covers the second five books). Amber Diceless is brilliant both as a game and as a translation of the novels into game form. I’d never played a diceless game before trying Amber, and its mechanics are both sound and perfectly suited to the feel of the series. I’ve also never played a game quite like it since. You start the game by bidding for attributes against the other players. Whoever bids highest in, say, Warfare, is the best in the group at fighting. If you challenge him at warfare, you simply lose; the trick is to shift the terms of the contest to bring your strengths into play. That notion — that the best cannot be challenged at what she’s best at — is pure Amber. The same goes for the attribute auction, which pits the players against each other in a way that mirrors how they’ll wind up pitting their characters against one another as the game progresses. 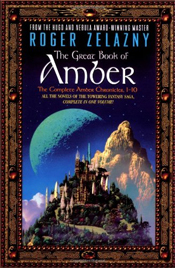 I recommend The Great Book of Amber, an inexpensive paperback volume that collects all 10 books — Appendix N and post-Appendix N — of the Chronicles of Amber. If I didn’t already own the whole series in individual paperbacks, this is the version I’d buy. At $25 or less, it’s cheap enough that you could decide not to read the second series and still get more than your money’s worth out of it. Whatever edition you choose, the Amber books are ripping yarns, fast-paced, consistently inventive and surprising, and highly engaging. You should read them, and I envy you the pleasure of reading them for the first time.